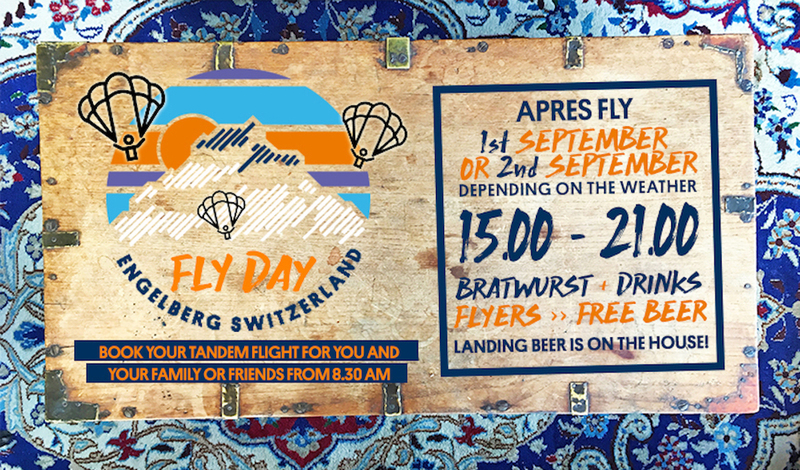 1st of September we will arrange a Fly day with our friends at Fly by para here in Engelberg. If the sun is shining and the winds are on our side we will go ALL IN for a friendly afternoon with bratwurst and beers. The to-become landing spot in front of the house is normally crowded by Engelberg locals, the cows, most of the autumn, but we managed to convince them to stay up on the alp for a couple of days more. We don’t think they mind staying on vacation just a bit longer… The real party starts in the afternoon where the grill is on fire and the beers will be cold. You can book a tandem flight via David Ferrer or Julio Rivera, between 8.30 AM – 17.00. CHF 200 for 15/20min flying. If the weather doesn’t allow us to do the event we will postpone it to 2nd of September.